The owners of this island paradise live at Matei Pointe, at the northern most point of Taveuni Island in Fiji. This remote island is about an hour plane ride north east of the main island of Viti Levu in Fiji. Until the solar power system was installed, the only power they had was a very noisy generator. 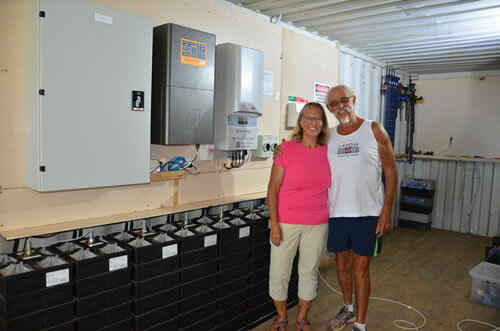 Due to their reluctance to run the generator the owners were restricted to storing all their food in a small Waeco fridge/freezer powered by a 12V battery using very limited lighting in their home. Living in a tropical paradise does have its dangers; Fiji is extremely prone to cyclones. In February 2016 the owners lived through cyclone Winston, which was the strongest cyclone to make landfall in Fiji in recorded history. 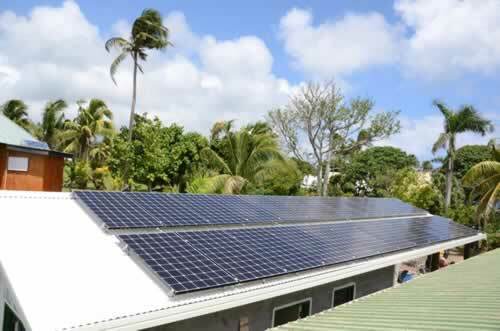 The owners recounted that some of their neighbours lost all their solar panels in the cyclone and were determined that their yet-to-be-installed system did not suffer the same fate. Craig Andrew of A Grade Solar Solutions installed all panels and racking to higher specifications than the manufacturer’s recommendations and housed the inverters and battery bank in the shipping container. If a cyclone is forecast then they can just lock the doors and all equipment is safe. There is provision for another 4 battery stacks. The family is thrilled with the outcome. They no longer have to run a noisy, smelly and expensive generator and their level of comfort in the house has increased significantly. They now have more than enough power to run lights, music and a TV and they have recently bought a large fridge and freezer. Life in paradise just got even better!